When you’re ready to take things to the next level, Yaniv suggests placing one hand on a dumbbell and one on the floor. This is a more advanced version of the previous exercise and Yaniv recommends alternating three reps on each side to insure equal coverage and muscle distribution. 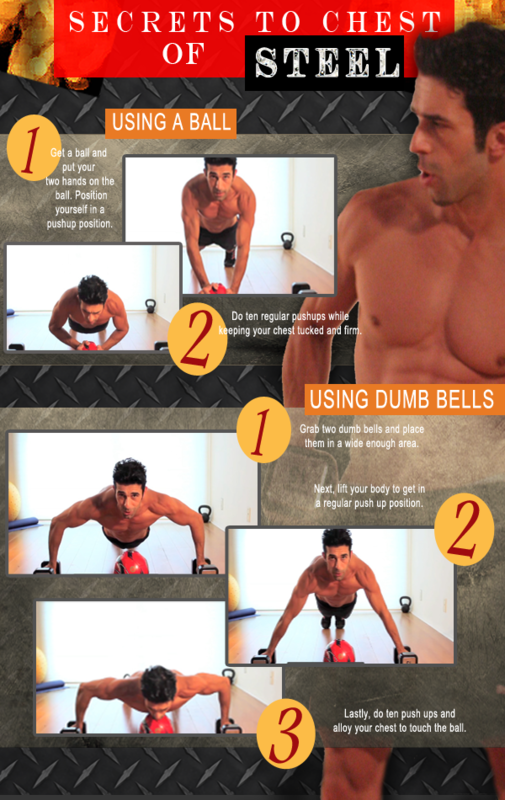 Make these easy, at-home steps a part of your daily repertoire and get started on your way to a rock solid, chiseled chest! This entry was posted in #Fitness, Beauty & Health, Fitness Tips, How To Guides, Men's Health, Uncategorized and tagged 2012, Abs, ball, breaking, chest, dumb bell, Exercise, Hollywood Tips, how to exercise, mens fitness, metal detector, Red Carpet Tips, Red Carpet Workout, Spotlight, steel chest, Yaniv Moyal. Bookmark the permalink.